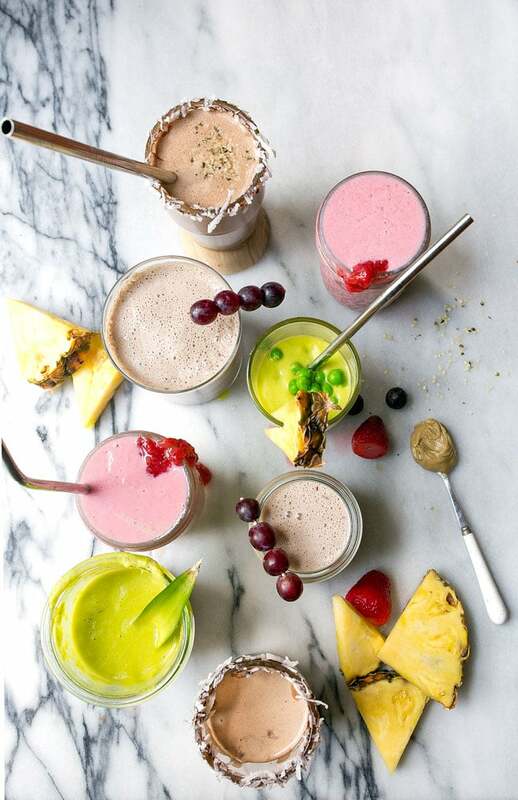 Protein smoothies for kids: four ways to cram protein into their little mouths. We’ve got a little problem on our hands. What you’ve been seeing on the outside is not what’s going on inside. On the outside (in my social media channels, lol), it appears my Camille is a great eater. Her favorite foods are broccoli, plain yogurt, garlic-dill sauerkraut, carrots, raw orange bell peppers, etc. All of that is true. What you don’t see is that she hates meat. Protein is a struggle for us. Camille spits out red meat like it’s the devil, obliges to eating chicken once a month max, and firmly believes that any brown crispy coating on meat is repugnant (yep, she won’t eat fried chicken). Oh, and then she kicks me while I’m down and has ambivalence towards beans. There are exceptions to the rule, though: Camille loves salmon and shrimp. I know I shouldn’t get mad about the fact that my kid would rather grab fistfuls of Brussels sprouts, hoover Castelvetrano olives, and pop cherry tomatoes like grapes—I’m just worried about her getting enough protein. And worrying is a Mom’s easiest job in life. I limit her consumption to about 1 cup a day, and hope that will encourage her to seek protein elsewhere. It hasn’t. I’m finally willing to accept that my kid is a vegetarian. Now, I’m going to keep serving her meat. But, if I take a step back, I see why this happened. I don’t eat a lot of meat, and I never really have. I definitely didn’t eat it more than a time or two a week while pregnant or nursing. I feel like she just maybe didn’t develop a taste for it? And then there’s the fact that I’ve been making excuses for her. She’s pretty late at getting her teeth (I talked about it in my nut-free granola post), and so I thought she just couldn’t chew the meat. But when I see her chowing down on pretzels and crispy homemade graham crackers, I know it’s just an excuse. All I can do is try to meet her protein needs in other ways. Plant-based protein ways. So, I developed these protein smoothies for kids for her over the last few months, and she absolutely loves them. I can’t express how good it feels after your kid downs a healthy smoothie. It almost makes you wanna get a ‘world’s greatest mom’ coffee cup. Almost. Until they pull their diaper off and pee behind your arm chair. 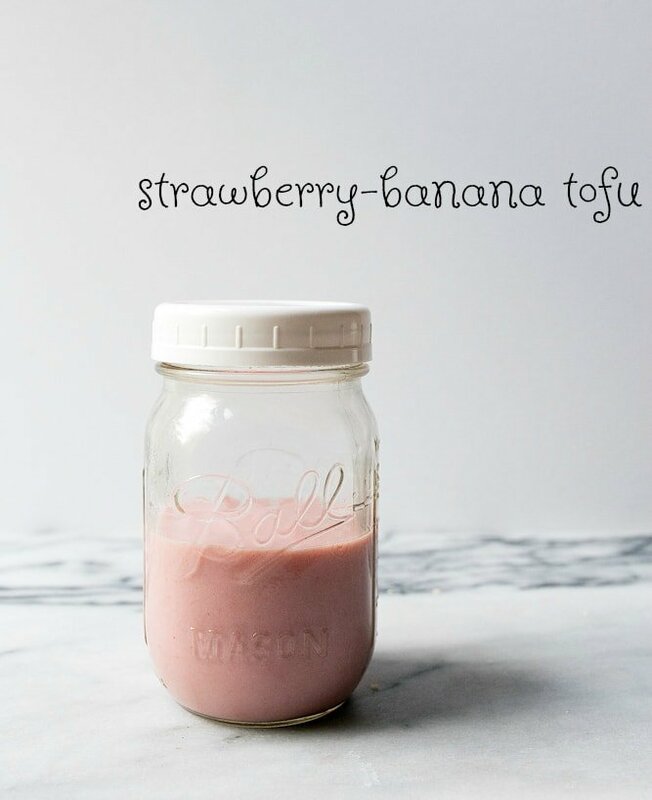 O N E: Strawberry-Banana Tofu Smoothie. Look, I realize there’s a special level of hell for people like me that hide tofu in recipes, but at nearly 3 grams of protein per ounce, I’m doing it for the kids. 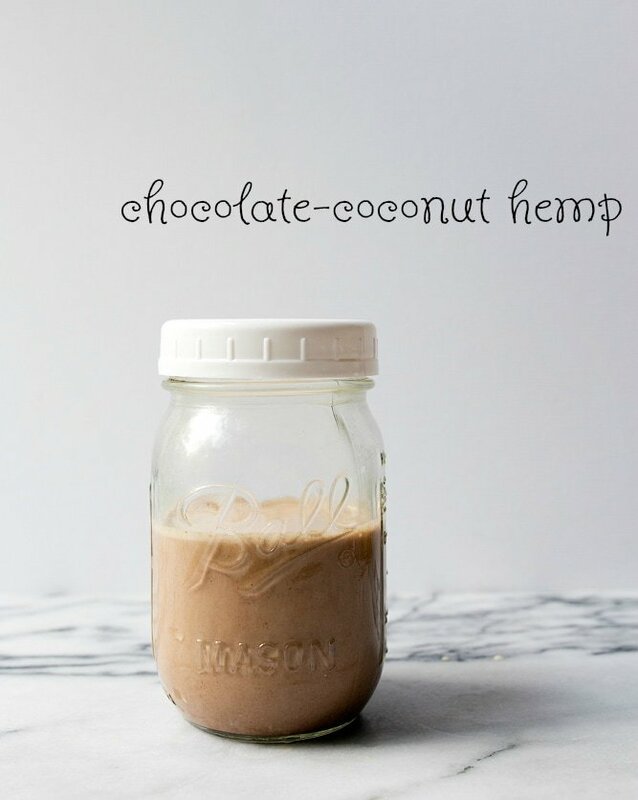 T W O: Chocolate-Coconut Hemp Smoothie. Hemp seeds are my freaking favorite. And not just because I swear they calm me down (probably wishful thinking), but I’m also very into their nutritional profile! 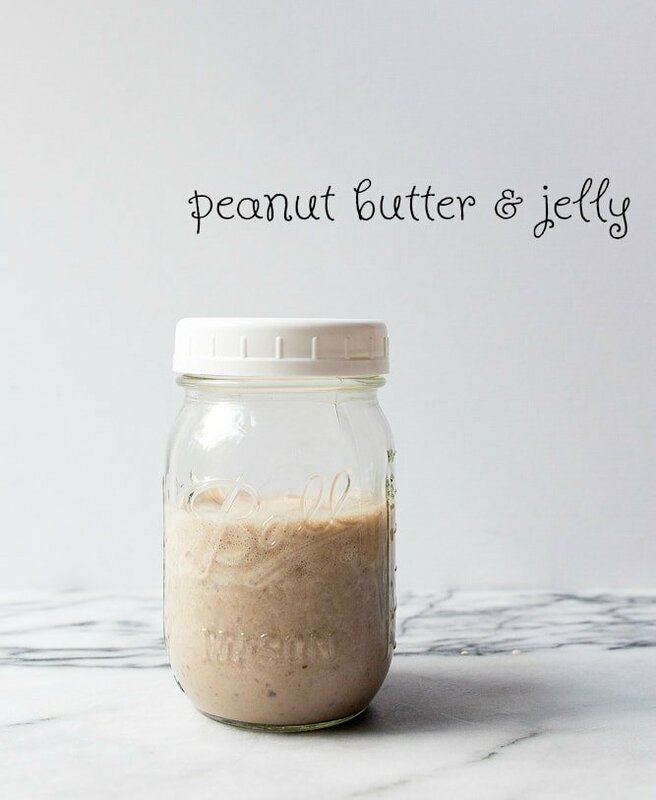 Just 3 tablespoons have 9 grams of protein! And since Camille will literally eat anything with chocolate in it, she loves this smoothie. 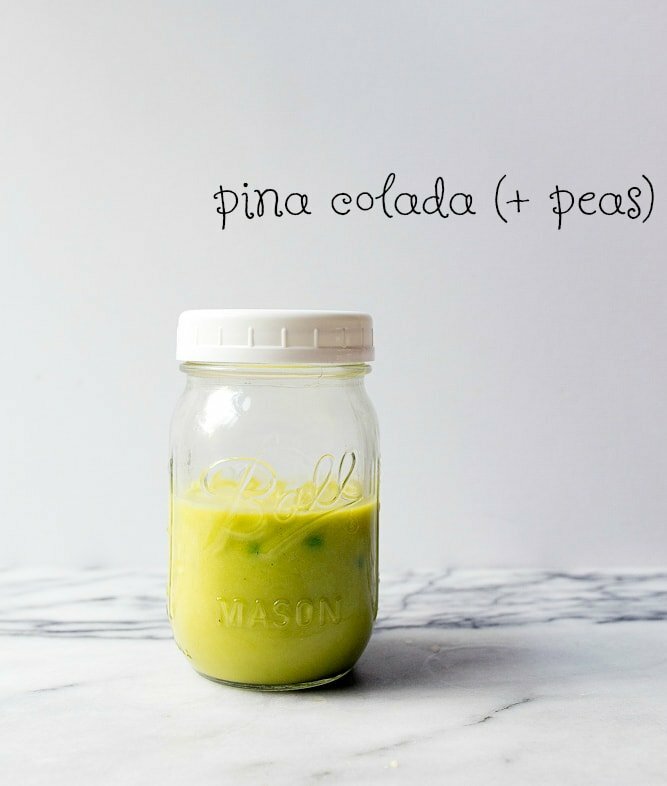 T H R E E: Piña Colada with Peas! I realize I’m lucky that my kid loves the color green and will drink this just because it’s pretty. But here’s the thing: I tasted this before I gave it to her and was seriously surprised by how good it is! I put the blender back on the base and made myself one, too! Admittedly, peas only have 4 grams of protein per 2/3 cup, which is less than what I was hoping for, but since they’re green, we get bonus points for that. F O U R: Peanut Butter & Jelly. My kid had never tasted a peanut butter and jelly sandwich until last week. She didn’t love it. But, she loves this smoothie because it has frozen grapes in it. I make these smoothies in double batches and freeze them. The night before I want to serve one, I move it to the fridge to defrost. In the morning, I pour it into a sippy cup–sometimes I have to add more water or milk to thin it out. The smoothies with coconut milk need to be slightly warmed since the fat tends to solidify on top of the jar. Give it a quick stir and serve for breakfast or at snack time. We all have our own problems we face when it comes to feeding kids. I happen to think that feeding kids and molding eating habits in a child is such an honorable, overlooked job. The way I see it, you have the power to give your kids a firm foundation to stand on for the rest of their lives with a healthy diet. I know that diet can’t prevent all health problems, but it certainly helps. If you even remotely care about what your kid eats, know that it is more than enough. You’re a good Mama. Your kid will be fine. In the meantime, let’s have a playdate and drink wine while the kids play, ok? 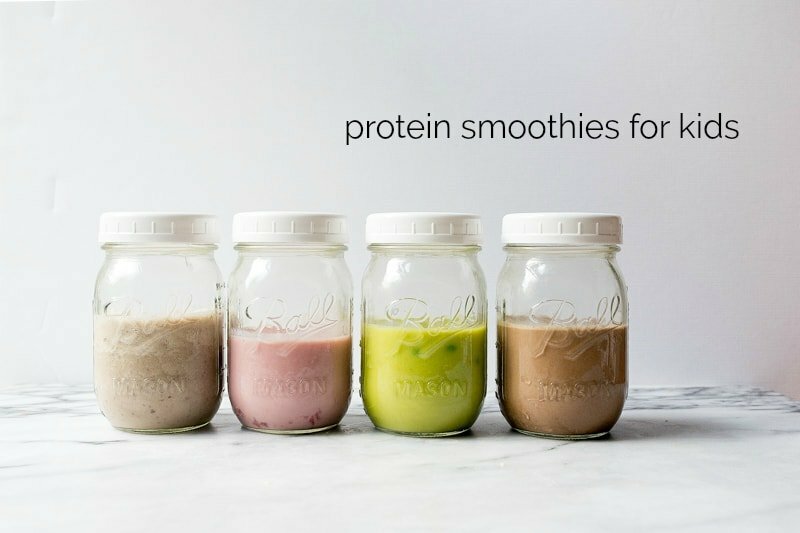 Let me know if you love these protein smoothies for kids! I don’t have kids (YET!) but can see myself unintentionally giving my babe my own weird eating habits. I’m not a vegetarian but almost never eat meat either – getting that protein has to be intentional! …also, I’m all about the fact you made a pina colada smoothie for kids. You go mama. These all look great (and adult worthy too) My son went through a “won’t eat meat” stage as well. But as he got older guess what? All he’d eat was meat and those veggies he loved became the devil. Kids go back and forth so try not to fret too much. I know, saying “don’t worry” is kind of crazy talk. With luck she’ll end up being an adventurous eater who likes a little bit of everything. I’m pretending to be a really chubby kid this week and trying them out! You know I’m not much of a fan of meat either so this is great for kids and us BIg kids :) love this and post more! Healthy and easy breakfast/lunch to-go should be next because the struggle is real! Also, I miss your face. Truly one of your more POWER-PACKED POSTS, Christina. I have bookmarked this and am passing this along to all I know. I find myself wanting smaller portions of smoothies/shakes than the 32 ounces I used to make. I like the 2 cup mason jar. I have a lid that fits on the wide mouth one that has a straw. The adult soppy cup. With all our devices at our elbows, they are a requirement in our house and motor home, Smidge. My kiddo used to be an amazing eater. And then something switched and now he’s being so frustratingly picky. It breaks my heart. But he loves smoothies. So I feel like I definitely have a secret weapon opportunity there. PS that diaper comment you threw in there. Spot on. Died laughing! This came at just the right time for me because I’m struggling to find a meat my 13 month old will eat more than one bite of! Also a big every other kind of food lover so I think these will be a hit. THANK YOU! Love this post so much! You’re so right that giving your kids healthy eating habits is an underlooked privilege of a parent. Or just underlooked period! I’d love to hear how you got Camille to eat so many foods in the first place. I just can’t understand how they start out naturally disliking yummy veggies. Maybe consider more posts on getting your kiddos to eat right? Love all your Instagram stories on this subject. Too cute!! So if you daughter loves milk, why limit her to 1 cup a day? It’s a great source of protein. If she loves fish, go with making seafood dishes. My kids love tuna burgers. Because I feel like the more milk she drinks, the less actual food she eats. Milk has so many calories that it fills her up, you know? I’m okay with milk AFTER she eats veggies, protein & grains, etc. You should be jubilant that your child (please stop using the word kid) doesn’t like meat. It’s not all that healthy and there is protein in a lot of food. And one last piece of advice from one (very old) mom to another: don’t worry so much. You will be so much happier and your daughter will be fine, I promise. Just note that the recommended daily allowance for juices or smoothies alongside your other meals is actually very small, less than 1 cup!This is mainly due to the amount of sugar. Coconut milk is very high in fat so use sparingly. I used to walk around as a child saying I was a vegetarian “but I like taco meat!” Then it expanded to “but I like taco meat and turkey!” and then “but I like taco meat and turkey and chicken and and and….” until one day I realized I wasn’t actually a vegetarian. Who knew! I definitely still don’t get enough protein though, so maybe I’ll start tricking myself into drinking some like you’re doing here. As a vegetarian since childhood, I want to help! It sounds like you have found some great ways to get protein. I don’t usually have a problem with it because I love beans and tofu, but another great way to get protein is greek yogurt. Thank you for the smoothie recipes, I will have to try these out. I’m sorry to read that it’s considered a problem on your hands that your child doesn’t like meat. It’s a much healthier way of life for their own health and for the planet. I’m glad to read you may be able to accept it. Did you read the part about how my husband and I don’t eat meat? It isn’t just the protein, it’s the iron in foods that she needs. For the rest of her life. I see unhealthy patients who are vegetarian or vegan. They are often anemic, and recover more slowly.